NEW ORLEANS – The first major weekend of the collegiate outdoor track & field season came and went and did little to change the top of the NCAA Division I Men’s Outdoor Track & Field National Rating Index. The most recent Rating Index, released Monday by the U.S. Track & Field and Cross Country Coaches Association (USTFCCCA), saw a small shift in the top-5 and a few minor changes in the rest of the top-25. Remember: The 2019 NCAA Division I Outdoor Track & Field Championships will be held June 5 through June 8 at the Mike A. Myers Track & Soccer Stadium in Austin, Texas. Texas Tech strengthened its billing atop the Rating Index thanks to a tremendous effort by Eric Kicinski in the discus throw at the Wes Kittley Invitational a few weeks ago. Kicinski hit a PR of 63.34m (207-9) and took over the national lead in the event. That is now one of eight top-8 marks the Red Raiders have in the TFRI Individual Rankings. Texas A&M cemented its spot at No. 2 after a strong showing at the Texas Relays this past weekend. Nathan Hite put up 7774 points in the decathlon to move up to No. 5 in the TFRI Individual Rankings, while the Aggies’ 4×400 relay team is now ranked third in the nation after it got the baton around in 3:03.30. Florida jumped one spot thanks to the performance of two of its relay teams. The Gators are now ranked second in the 4×400 (3:03.25) and third in the 4×100 (38.69) after what they turned in at the Florida Relays this past weekend. BYU saw a trio of athletes strengthen their spot in the TFRI Individual Rankings this past weekend. The fourth-ranked Cougars watched Conner Mantz move up to No. 4 in the 10,000 (28:18.18), Clayton Young improve to No. 5 in the 10,000 (28:18.50) and Matt Owens put his name sixth in the steeplechase (8:36.00). Alabama dropped two spots from the preseason to no fault of its own. After all, Gilbert Kigen clocked a time of 28:20.28 in the 10,000 at the Stanford Invitational this past weekend and is now billed seventh in the TFRI Individual Ratings in that event. The rest of the top-10 included No. 6 LSU, No. 7 Florida State, No. 8 Oregon, No. 9 Houston and No. 10 Georgia. Teams that made the biggest moves since the preseason include Western Kentucky (up 63 spots), Sam Houston State (up 35 spots) and Southern Illinois (up 35 spots). 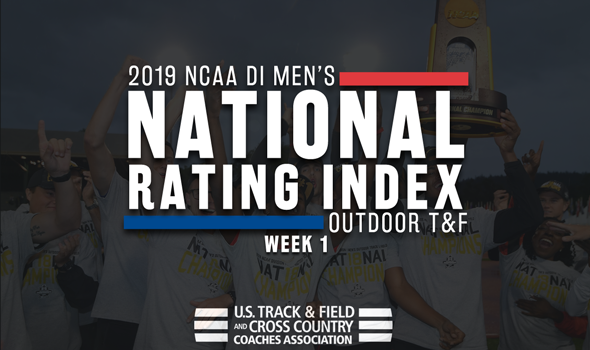 You can see the next edition of the NCAA Division I Men’s Outdoor Track & Field National Rating Index on Monday, April 8 at 1 pm CT.